During the war of The Harshland Jenner Faulds posed as a man to join the fight. When the war ended, most soldiers struggled to find a place for themselves in the new world. Some became licensed investigators known as Fairmen, and so Jenner became the first Fairlady. Jenner’s latest case finds her on the trail of a bookkeeper who has absconded with a serious amount of money. The discovery of an artefact from a legendary magical battle leads Jenner to her quarry but upon finding her, Jenner quickly realised that the money is not the reason Samanda is on the run. I’m going to be honest up front and say that, having read this first issue, my overwhelming feeling was that the team at Image sat down and said “So, what are we going to do while SAGA is on hiatus?” I don’t know whether it was an intentional, conscious decision on the part of the creative team, but the look and feel of the artwork, the high fantasy world the characters inhabit, even Jenner’s hairstyle, could have been culled from the Saga guide book. At one point I actually had to stop and check whether this was a spin off series. 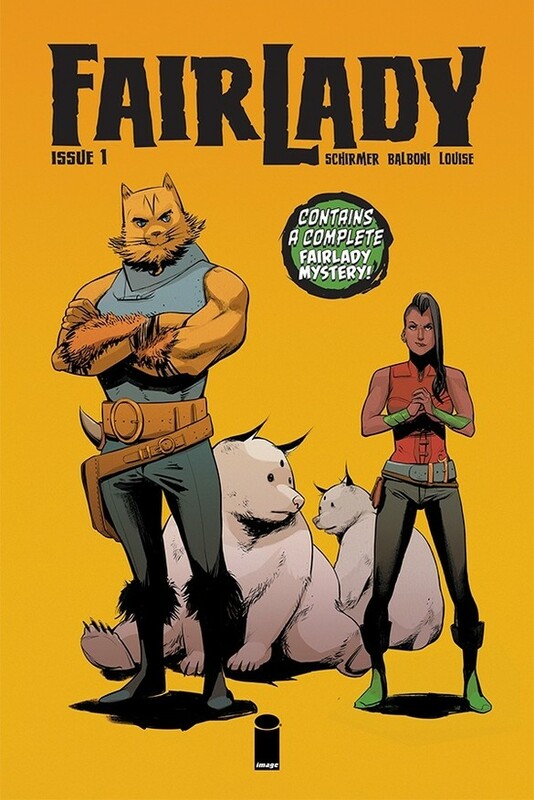 Don’t get me wrong, this is probably great if you’re looking for something that is similar to Saga while you’re waiting for Brian K. Vaughan and Fiona Staples to stop toying with us and get back to work, but it’s not so great if you’re looking for something with its own voice and style. If that all sounds a bit harsh, take solace in the fact that this is actually a well-written and illustrated story and there are much, much worse things in this world than being criticised for being similar to one of the best-selling comics of the last few years. The salvation of this issue, for me, is the artwork provided by Claudia Balboni and Marissa Louise. The world they’ve created on the page has some really interesting designs, the scenery is fantastic and some of the incidental panels are beautiful, particularly the Buddha lying in the surf. I think there is the potential there for them to produce some really stunning art as the series progresses. Overall, the similarities between Fairlady and Saga drag it down and make it this an underwhelming experience, which is a real shame. Fairlady really deserves to have its own voice and style, and there’s the potential for this to be a great series but at the moment, it’s just coming across as a pale imitation of someone else’s work for the time being.